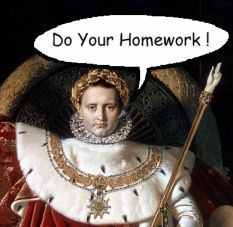 The word "imperative" is derived from the term "emperor". Emperors give commands, and imperative sentences are commands. Imperative sentences consist of predicates that only contain verbs in infinitive form; verb phrases are not allowed. The implied subject of an imperative sentence is "you". Imperative sentences are generally terminated with an exclamation mark instead of a period. Look in the drawer of the dresser.